Crawford Packaging will be exhibiting this year at the CPMA Annual Convention and Trade Show on April 25-26th in Vancouver, British Columbia. If you are attending this year’s CPMA show, come visit us at Booth #138 and discover the Crawford Packaging advantage. This year we are excited to be highlighting our amazing offering of produce films. We offer produce film solutions for a variety of product ranges and packaging formats. Produce packaging films are one of the key components to protecting your fresh produce on its way to market. In today's market, it is estimated that between 25-50% of all fresh food is lost before it makes it to market. Produce packaging and films work to reduce food loss by increasing protection and extending product shelf life. 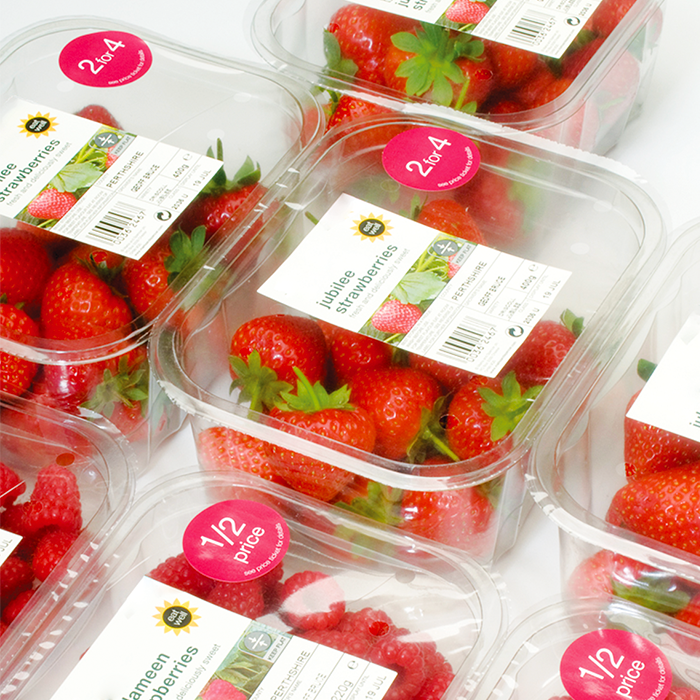 Top seal packaging is one of the fastest growing packaging methods in the produce market today. These reusable containers offer produce Growers the added protection of a hard container, but with up to 25% less raw material used. Top seal films are made from a variety of materials and work on most tray sealing machines brands. GrowPack top seal films are designed to work with metal, fiber and plastic packaging trays. GrowPack works with industry leaders to create top seal films of the highest quality and clarity to offer consumers a crisp view of your product. GrowPack films are made from 100% recyclable materials, or advanced polyethylene made from renewable sources. GrowPack shrink wrap films offer Packers incredible clarity and strength and can be used on any existing shrink packaging system. GrowPack shrink films are available in super thin gauging for increase roll yields for longer run times. These films offer incredible optics for amazing shelf appearance while promoting healthy gas exchanges to extend shelf life. 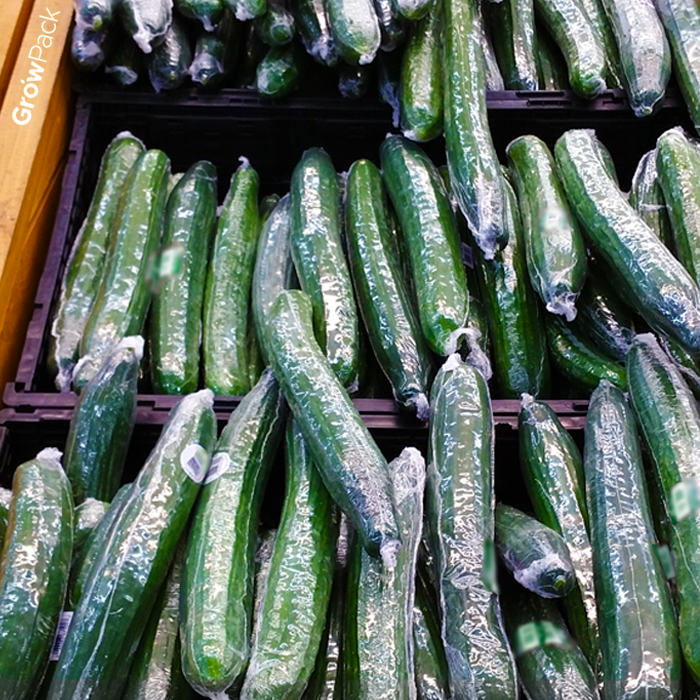 GrowPack’s premium cucumber films are made from strong resins and use a specially engineered pre-perforated design. On properly calibrated equipment GrowPack Premium Cucumber Film run at higher speeds than conventional cucumber films. This increases equipment output while decreasing energy consumption due to a lower required heat. The thinner, stronger cucumber film is available at the same pound per roll and has been able to increase per roll pack yield by 10%-15%. Flow wrapping is the process of creating a bag around a product as it moves through a flow wrap machine. Packages can be created for individual items or for bulk produce packaging solutions. Flow wrap films are made from BOPP plastics and can be printed for increased branding opportunities. GrowPack flow wrap films are made from custom manufactured BOPP films (biaxially oriented polypropylene), which are one of the most popular plastic films today. Custom manufactured to exacting specifications, GrowPack premium flow wrap films are market proven and offer excellent machinability. With a new product line came a Mexican grower's new opportunity to upgrade their packaging. A Crawford Packaging Specialist recommended top seal, and the results spoke for themselves. A produce farmer in Brantford, Ontario needed a more efficient packaging process for bags of peppers. A Crawford Packaging Specialist found the answer. How we helped save a fresh produce grower’s new product launch at one of the largest produce tradeshows in North America.